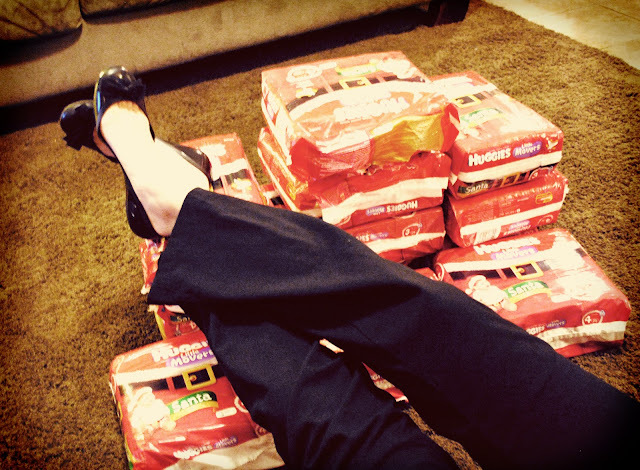 13 packages of Santa Huggies Diapers regularly priced at $12.29 each on sale for $5 each for a total of $65 (before tax). OF COURSE I had my handy dandy coupons totaling $25.50 so my total price was $39.50 (before tax) for an approximated savings of $120.27. I received an email about this sale and spread the word to all my friends. I got to the store 10 minutes before they opened and was the first one back to the diapers at 9am. I grabbed 10 packages of size 4. Another lady got all the other size 4 packages (8). We both headed up to check out where we were asked if a sale was going on by another customer. She ran back but we had gotten all the 4 sizes. We both quickly handed her some of ours because after all tis the season of sharing and caring!!! The store was sold out of size 4 by 9:15 am. So I was all set with my 8 packages of diapers. BUT my sister, Heather, wanted some diapers too so I went back after work and purchased 5 more packages of size 3 for her and ended up clearing every last package off the shelf! What a great deal, at that price I would have Reegan in Christmas diapers year round! Haha! 16 boxes of Johnson & Johnson 3 item gift set which included bath wash head-to-toe, bubble bath and lotion normally price at $9.99 on sale for $4.49 each for a total of $71.84 (before tax). I actually went to Target to exchange some flats that were only a week old with the lining coming out. So I had a gift card of $5.88 (the cost of the shoes...another great sale! LOL!). So my total $72.64. HOWEVER, quick to save a few more dollars I printed out $8 worth of Johnson & Johnson coupons, found a $5 off $50 purchase from Target coupon, grabbed my receipt and headed back to Target the next morning. I ended up getting $13 cash back so my total was $59.64...that means I paid $3.72 per package which was $1.24 per bottle!!!!! My savings was $106.88. Well I went to Target to exchange some flats that were falling apart after only a week. I had a gift card and planned on getting some lotion and bath items for Reegan. After looking at the sales I had my 3 bottles and was heading to check out when a gift package caught my eye. I thought to myself that gift pack will be about the same price but one bottle was a larger size so it was a slightly better deal. I grabbed that and went to pay. When the cashier rang it up she said that my total was $4.51 and I was WHAT?! She verified and I said I need to go get some more. I went back and CLEARED the shelves of every package they had. When I got up to the register a new cashier didn't look to thrilled about having to bag up 16 box of baby goods. I said just throw them back in the cart. The customer that had just checked out asked if there was a sale I said yes but they weren't even marked on the shelves. I said I'm pregnant, my sister is pregnant and I have a 16 month old so I took them all. LOL! They laughed and gave me a pat on the back. They cashier upon seeing the price asked if there were anymore left and I said NO! Haha! I was so excited about this deal I forgot I had a $5 off $50 Target coupon and I only used my $5.88 gift card for the shoes exchange. SO I headed back the next day with my reciept, the Target gift card and $8 of Johnson & Johnson coupons I printed off. See Jen's HERE and Kim's HERE and we all did Christmas theme items!!! Christmas gifts, ornaments and diapers! See the group comparison HERE!